GWINN — There are several things that can cause a basketball team to lose a game, but two of the most common are missed shots and foul trouble. That’s what the Gwinn girls team had to deal with Thursday night against Gladstone. The Modeltowners looked to be in control early in the game before shooting woes from beyond the arc crept in and the fouls increased. 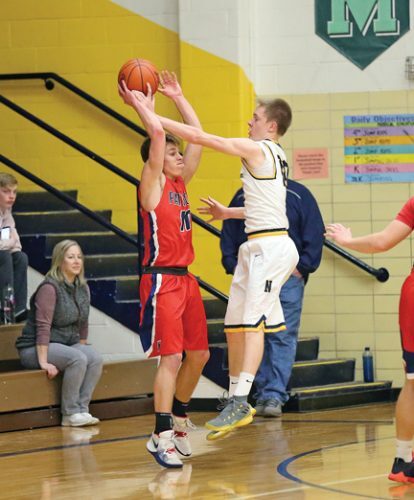 The Braves worked to take the lead in the third quarter, then took advantage of Gwinn’s foul trouble by making their free throws down the stretch to emerge with a 55-47 victory. “I’ve got really two post presences,” Modeltowners head coach Ben Olsen said. “I’ve got Marissa (Delmont) and I’ve got Tianna (Taylor), and they had four fouls with seven minutes to go at the start of the fourth quarter. “To be honest, I really didn’t have a game plan for not having one of them out there. One of them had to be out there and then all of a sudden, it’s what do you do? Do you roll the dice and keep one of them out there or both out there? 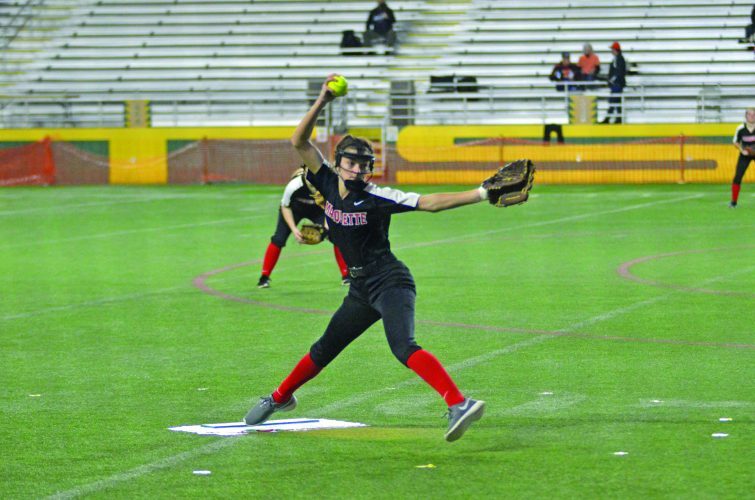 “We decided to sit them and I’ve got girls playing in the middle of our zone (defense) that have never really played in the middle of our zone. 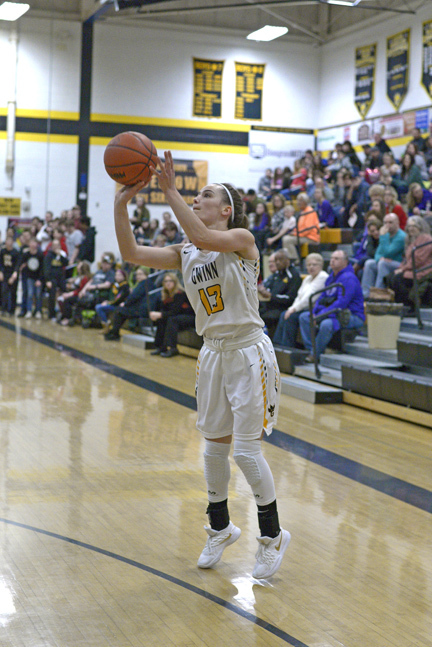 Gladstone’s Megan Crow led all scorers with 20 points, while Alaina Trudeau had 18. Trish McGuire and Brooke Mannor each had 11 points for the Modeltowners. The game was back and forth in the first quarter with a Taylor layup putting the Modeltowners up 11-9 at the end of the period. Gwinn then built on that slim advantage with three free throws and another layup from Taylor. After the Modeltowners made two more free throws, Gladstone got a basket from Crow and a trey from Trudeau to cut Gwinn’s lead to 18-17. However, Mannor made a nice cut to the basket in the closing seconds of the half to put in a layup and extend the Modeltowners lead to 20-17 at the break. In the second half, things started to go the Braves’ way. A three-point play from Crow gave Gladstone the lead at 21-20, but Mannor answered back with two free throws. That was the last time Gwinn held the lead, though. A three-point play from Maddie Ahlgren put the Braves up 26-22 and later on, six straight free throws bumped Gladstone’s lead to nine, 34-25. 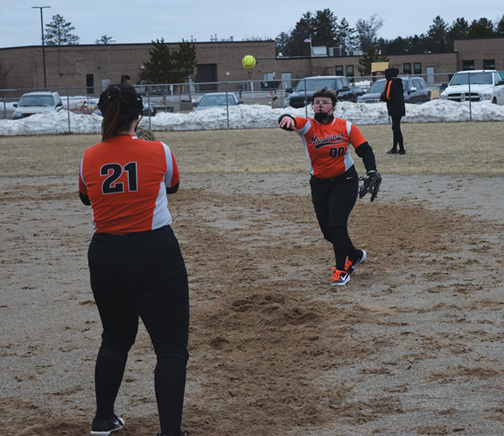 “The conversation after the game was that we’re starting to get into a routine of getting ourselves in holes and then fighting our way back the whole entire game,” Braves head coach Andy Cretens said. “I give credit to Gwinn. They came out with some intensity and they flat-out defended us early on and they got us out of our element. The Modeltowners rallied, though. Emily Curtice completed a three-point play and a triple from McGuire helped get Gwinn within one, but a layup by Crow made it 36-33 Braves going into the fourth. That’s when Gladstone started to pull away. Trudeau’s three-point play made the game 47-39 in favor of the Braves and more free throws eventually pushed Gladstone’s lead into double digits. 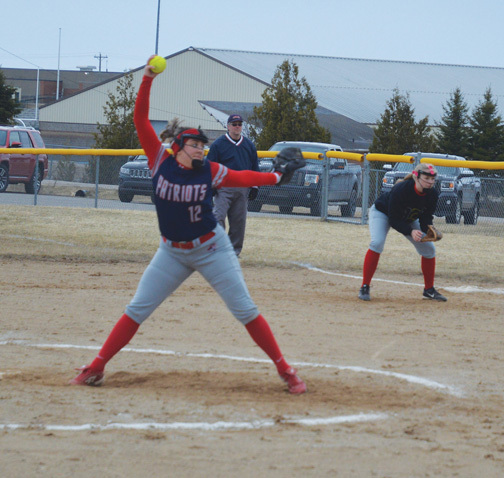 Gwinn didn’t quit as a triple by Mallory Delmont brought the Modeltowners within six, but it wasn’t enough in the end. “These girls never will quit,” Olsen said. “This group has been with me for so long that we’re going to battle right to the end. 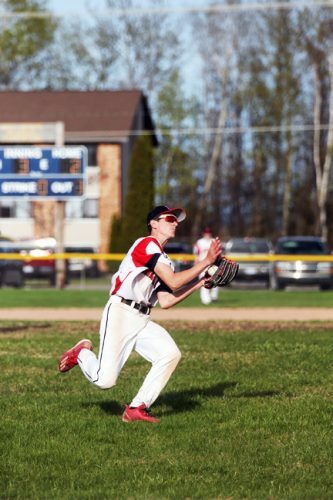 “Ever since the L’Anse game in the middle of the season, we’ve just struggled to make shots. Unofficially, we were 4 of 28 from the 3-point line tonight. If you come to watch us in practice, that’s not our girls. That’s not who we are. We spend 45 minutes a day usually on shooting and they’re knock-down shooters, and for whatever reason right now, when the game lights come on and the scoreboard comes on, we’re struggling to make shots. “I don’t know what it is. I go on film and I try to get us the same looks that we’re getting in games, but for whatever reason, they’re going in in practice, but not in games. I’m hoping our luck is going to turn around here, hopefully come March and maybe we’ll make a little run in March.